Finding the best cat food for your cat is often a trial and error method – you try and they demonstrate your error with their disgusted look at your selection. Not all cats will eat all foods so if you have a selective feline, the first step is to understanding a little about how cat nutrition works and this may help you make better selections – as far as your cat is concerned! There are two main categories of cat food – wet and dry. Both types of food are designed to have loads of goodness and nutrients in them so sometimes the selection of which is best for your cat is more their preference than anything. However if your cat has particular dietary needs then you can also get a range of different foods to help. Like in humans, cats have a range of elements that they need to remain healthy. One of these is dietary protein because it supplies essential amino acids. These are used to create anti-bodies, enzymes, hormones and for a balanced pH level in the body. It also gives the cat energy and allows them to grow and develop when they are young. These proteins are found in meat, fish, eggs and poultry as well as, to a lesser degree, in legumes, grains and vegetables. The substances that this latter category don’t provide is something called Taurine. Taurine is an amino acid that originally wasn’t considered to be relevant to a healthy feline diet. That was until it was discovered that pets were dying from a diet that didn’t contain taurine. Now, most types of cat food have this specifically added to them to ensure the problem doesn’t reoccur. Fats are needed to provide energy as well as fatty acids that is needed to utilise other nutrients. It also adds to cell integrity and make the metabolic rate work properly. Saturated fats come from animal sources while polyunsaturated fats come from plant sources. Feline health requires fatty acids such as omega-3, omega-6 and a range of others. Cats need to eat meat to get most of these fatty acids and within them, they can develop problems with their skin and coat. Minerals are involved with physical reactions in a cat. 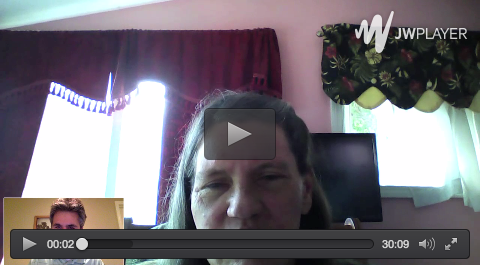 They are stored in bone and muscle tissue and are generally gained from the earth or water. Essential minerals include calcium, copper, fluoride, iodine, iron, magnesium, potassium, silicon, sodium and zinc. Vitamins are used for regulation of the metabolism as well as normal growth. Vitamins are either fat or water soluble and cats take in vitamins better from animal sources rather than plant sources. Fat-soluble vitamins get stored in the body while water soluble ones pass through the system much quicker. The main thing to look for when selecting a standard dry cat food is that is doesn’t contain any grain fillers. This can be things like corn, wheat or rice and they serve no real purpose to a cat’s diet because they don’t need carbohydrates. Dry cat food has a high convenience factor because it can be put out for the cat and left there without any change in its condition. This allows the cat to eat when and how much they want and avoids your cat chasing you around for food. The number one ingredient in this product is real turkey and it contains no fillers or artificial flavours. It provides omega-6 and high quality protein for your cat’s diet and is an antioxidant blend. It works to help minimalize hairballs and keep your cat at a healthy weight especially for indoor cats. This food is made from real chicken and does not contain and grain filler. It also contains salmon oil, which can provide extra vitamins. 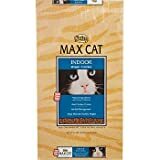 This food is balanced nutritionally for adult cats and is specially designed for indoor felines. It has high quality ingredients for better digestibility and is high in natural protein for a lean and energetic animal. The best all round diet for a cat is a combination of wet and dry food. Wet food has a shorter lifespan once out of the can, unlike dry food but does have a lot of other benefits. The first one being it is high in protein, which is crucial for a cat’s health. Protein deficiency can lead to weight loss, a dull coat and skin, lethargy and a poor immune system. Dry food contains usually around 33% protein but wet food is normally 40-60% protein. The other important element with wet food is hydration. In the wild, cats often get their moisture from the water content of their prey and their nature makes them less inclined to drink. Therefore when living at a pet, they need to make up this water source from somewhere and wet cat food is best way of doing this. The combination of both types of food also helps mimic another typical wild instinct – variety. In the wild cats will eat whatever they can catch and this is rarely the same bird or mouse every time. Therefore, our pets can get equally bored with their food so by using wet and dry food, you can provide the variation that is more what they are ingrained to seek. Whiskas is one of the biggest names in cat food and this is part of the Choice Cuts range. Available in pouches instead of tins for easy of storage, this food comes in beef in gravy, chicken in gravy, turkey in gravy and tuna in sauce in this particular pack, allowing a variety in the diet for your cat. This is a range of different wet foods in a variety of flavours that is ideal for all types of cats. 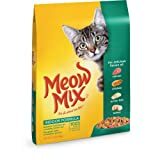 It is recommended to feed 1 can per 3 pounds of body weight with double with amount for kittens and pregnant cats needing 2-4 times their normal portion. This is one example of a range of 13 different flavours that are balanced for cats and also to help growth in kittens. It contains low magnesium and works to balance the urinary pH in the cat’s body. One of the top names in organic dry ca food is Newman’s. They used only USDA-graded meat and other ingredients that would be suitable for humans in other types of food. There are no artificial colours or flavourings as well as no preservatives and are made from a minimum of 70% organic ingredients. This means the food has been made without chemical pesticides being used as well as no herbicides or fertilisers. This mixture is made with organic chicken and contains brown rice but no fillers such as wheat or corn. It has an ideal protein to fat ratio for adult cats and doesn’t contain any antibiotics, hormones, pesticides or chemical additives. It also features peas and carrots for additional vitamins and minerals. 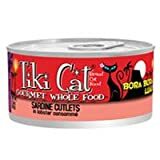 This food is made with certified organic ingredients and has a balanced nutrition to it that is excellent for your cat, and also piece of mind for you with its organic nature. It has no artificial colours of preservatives as well as being free from corn, wheat or soy. Allergies in cats are very similar in principle to those suffered by humans – they tend to be something inhaled, something in the environment or something they have eaten. It is when the immune system overreacts to that particular substance and can be things as mundane as house dust, pollens, powders, wool or even feathers. To be an allergy, the reaction must occur at least twice and if this is the case, it often pays to consult a vet to be sure what the cause of the problem is. There are two main types of allergic reaction. An immediate reaction usually involves hives and itching, usually around the head and eyes and occasionally welts on other parts of the body. A delayed reaction can be anywhere from hours to even days after the exposure and is usually itching. With cat food allergies, these are most commonly to chicken, fish, grains such as wheat or corn, or soy. Sometimes allergies develop to dairy products, and beef or pork. An intense reaction such as the development of an itchy rash is common, hair loss, sores from constant itching and diarrhoea and vomiting may all be seen. Natural Balance are one range of food that may be suitable for a cat with allergies as their good only contains limited ingredients. This allows you to control what you cat eats and make sure whatever causes the allergic reaction isn’t hidden in the list of ingredients. This example of the Natural Balance range features green peas that are high in potassium and easy to digest with fresh salmon, a high quality protein source. It also contains important elements such as taurine, calcium and manganese for overall health. This is a wet food designed for cats and kitten with allergies and is grain frees with no artificial flavours or colours. As with the dry food, it also has sources of vitamins and minerals such as salmon oil, kelp and taurine. A study by the APOP (Association for Pet Obesity Prevention) in 2011 estimated that 50% of all cats were overweight or obese and this can have similar long-term health effects in cats as in humans. These can include diabetes, arthritis and hepatic lipidosis, commonly known as feline fatty liver syndrome. The equation is simple – any mammal that takes in more calories than they burn off will increase their weight. In the wild, animals have to expel a certain amount of energy to catch their prey and therefore recharge the calories used. But in the life of a pet, food is provided with little work involved, apart from a few meows to let people know they are hungry. Therefore, the main thing to do look at with an overweight cat is the amount of food you are providing them. The other thing to look at is what is in the food because if the food has lots of fillers in the form of carbohydrates, these can aid in the weight gain because cats cannot naturally process them. It also helps to provide your cat with ways of burning off some of the calories in the form of toys and cat perches. These can be great fun and mimic inherent behaviours such as seeking a high place for safety. This is a real chicken protein high food that also includes vitamins, minerals as well as taurine. It helps maintain healthy weight and also manage hairballs. It is designed to be balance especially for overweight or less active cats. Not only does this food help with weight control, it is ideal for diabetes and other similar medical conditions. It is made with sustainable sardine and in a way that it is biologically appropriate – it mimics the moisture, protein and fat that cats would naturally gain from their prey. It is also free of carbohydrates.